John Bardeen (May 23, 1908  January 30, 1991) was an American physicist. He is the only person to have won two Nobel prizes in physics: in 1956 for the transistor, along with William Bradford Shockley and Walter Brattain, and in 1972 for a fundamental theory of conventional superconductivity together with Leon Neil Cooper and John Robert Schrieffer, now called BCS theory. He is currently the only physicist to have won the Nobel prize for both experimentation and theory in physics. John Bardeen was born in Madison, Wisconsin to Charles and Althea Bardeen. Charles was a professor of anatomy at the University of Wisconsin-Madison and helped start its medical school. Althea, before marrying, had taught at the Dewey Laboratory School and run an interior decorating business; after marriage she was an active figure in the art world. Bardeen graduated high school at age fifteen, even though he could have graduated several years earlier. His graduation was postponed due to taking additional courses at another high school and also partly because of his mother's death. He entered the University of Wisconsin in 1923. While in college he joined the Zeta Psi fraternity. He raised the needed membership fees partly by playing billiards. He was initiated as a member of Tau Beta Pi engineering honor society. Bardeen received his Bachelor's degree and Master's degree in Electrical Engineering from the University of Wisconsin in 1928. He had taken all the graduate courses in physics and mathematics that had interested him, and in fact, graduated in five years, one more than usual; this allowed him time to also complete a Master's thesis, supervised by Leo J. Peters. His mentors in mathematics were Warren Weaver and Edward Van Vleck. His main physics mentor was John Hasbrouck van Vleck, but he was also much influenced by visiting scholars such as Paul Dirac, Werner Heisenberg, and Arnold Sommerfeld. Bardeen stayed on for some time at Wisconsin furthering his studies,but eventually went to work for three years at Gulf Research Laboratories, the research arm of the Gulf Oil Company, based in Pittsburgh. After the work failed to keep his interest, he applied and was accepted to the graduate program in mathematics at Princeton University. Bardeen studied both mathematics and physics as a graduate student, ending up writing his thesis for the mathematical physics Ph.D. on a problem in solid-state physics, under Nobel Laureate Eugene Wigner. He received his Ph.D. from Princeton in 1936. Due to his father's death in 1935, Bardeen was not able to finish his thesis before he went to Harvard University on a postdoctoral fellowship and had to finish it during his first term there. While at Princeton, he met Jane Maxwell during a visit to his old friends in Pittsburgh. He would marry her before his time at Princeton had ended. After the end of World War Two, Bardeen started seeking a return to academia, but the University of Minnesota did not realize the importance of the young field of solid-state physics. They offered him only a small raise. 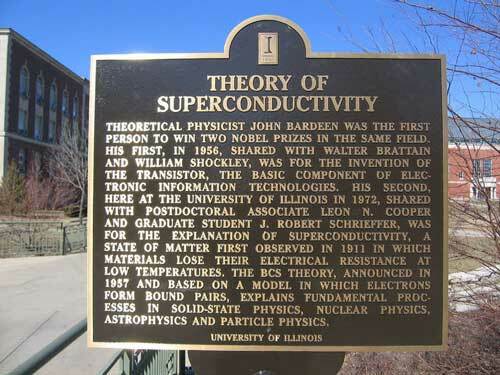 Bardeen's expertise in solid-state physics made him invaluable to Bell Labs, which was just starting a solid-state division. Remembering the lack of support he had received previously from the university to pursue his research, he decided to take a lucrative offer from Bell Labs in 1945. In October 1945 John Bardeen started work at Bell Labs. He moved his family to Summit, New Jersey, a quick bus ride from the Murray Hill research campus. He rekindled his friendship with Walter Brattain, who he had met previously through his brother; Brattain's brother had also been a Princeton graduate student. On December 23, 1947, Bardeen, Brattain, and William Shockley (Bardeen's manager at the time) unveiled the transistor, which earned them the Nobel Prize in physics in 1956. Bardeen joined the engineering faculty at the University of Illinois at Urbana-Champaign in 1951. His first PhD student was Nick Holonyak (1954), the inventor of the first light-emitting diode in 1962. He also received the IEEE Medal of Honor in 1971 for "his profound contributions to the understanding of the conductivity of solids, to the invention of the transistor, and to the microscopic theory of superconductivity." Bardeen was a man with a very unassuming personality. While he served as a professor for almost 40 years at the University of Illinois, he was best remembered by neighbors for throwing wonderful cookouts where he would cook for his friends, many of whom were unaware of his accomplishments at the university. In his honor the engineering quadrangle at the University of Illinois at Urbana-Champaign is named the Bardeen Quad. Bardeen died of cardiac arrest on January 30, 1991 in Boston, Massachusetts.